Apache Allura™ / Tickets / #8116 Branches directly from Tickets. #8116 Branches directly from Tickets. One of the basic and maintainable style followed by teams is to create branches related to tickets, and limiting the creation of branches. I think this is a common trend and we should make a feature which would add an option on tickets page to instantly create a new branch from desired base. I believe this would help definitely to manage rogue branches even for frequent committers. Also it helps to directly match what code changes are related to a particular ticket. This would be completely optional and a team can switch it on only if they would want to limit and manage branches. -One of the basic and maintainable style followed by teams is to create branches related to tickets, and limiting the creation of branches. I think this is a common trend and we should make a feature which would add an option on tickets page to instantly create a new branch from desired base. I believe this would help definitely in rogue branches. +One of the basic and maintainable style followed by teams is to create branches related to tickets, and limiting the creation of branches. I think this is a common trend and we should make a feature which would add an option on tickets page to instantly create a new branch from desired base. I believe this would help definitely to manage rogue branches even for frequent committers. Also it helps to directly match what code changes are related to a particular ticket. I was just going through and I believe we might face the following problem while implementing this. We will need to check if there are multiple SCM tools since the ticket tool might be used for multiple ones. And this might be difficult to implement since Allura does not have a one-to-one relationship with the SCMTools and the Trackers. For example: https://sourceforge.net/p/texstudio/ which has two trackers and two mercurial sources. This would reduce the number of stale branches that have already been merged into the codebase and solve the problem you were mentioning. 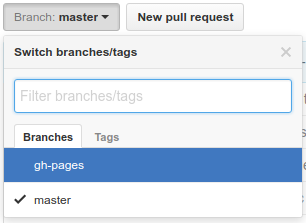 Also, we can have a way to change the branch by searching like the one in github. I think the implementation won't be that difficult as we can provide one more option as to which repo we actually want to relate that branch to. 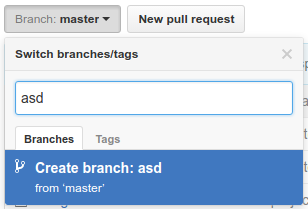 Create a branch, in this SCM, to improve/fix the issue/feature specified in this ticket. As this is originally inspired by Jira (Atlassian) which provides such a functionality, we can further add a Jira as a integrated service in allura projects. And yeah, this can be extended by adding options to as suggested of creating and deleting branches online. Though the stale branches issue will be resolved using the suggested means, but creating a branch to solve a particular issue type of thing is a development cycle what I have seen most agile teams follow. As it doesn't allows stale branches to exist in the first place.